Welcome to the complicated world of international motorsport, friends, a place where your every word choice matters. Here’s a quick rundown of why, exactly, F1's 1000th race probably shouldn’t actually be called its 1000th Grand Prix. This is a crucial distinction here. A race and a Grand Prix may seem like one and the same thing, but they aren’t! A race is just that: a race. Cars competing against each other. It’s the thing that the Average Joes do when they try to take off from the stoplight faster than the person next to them, and it’s the thing F1 drivers do twenty-odd weekends a year. A Grand Prix, however, implies something bigger—a race with a specific set of rules, a definite shape, a cohesive structure linking it to other races, and a prize. A grand prize, even. So, a Grand Prix is a race, but a race is not necessarily a Grand Prix. Back around the turn of the century, what we’d point to as being Formula One was simply referred to as “Grand Prix Racing.” If you want to read more about the origins and debates on all this, go look at the wonderful 8W discussion of it, but I’ll get into a bit as it’s important. Though it’s fair to say that you can trace formal Grand Prix-style races back into the 19th century without much difficulty, it’s probably wise to say that it was codified with the French Grand Prix in 1906, or maybe the Gordon Bennett Cup of 1900, or the Grand Prix at Pau in 1901. A bit more definitely, the Fédération Internationale de l’Automobile (FIA) was founded three years later as way for drivers’ interests to be formally represented and racing to be formally organized. In any case, it wasn’t until 1950 that an actual Formula One driver’s championship was established, with only seven races of the 20-odd grands prix of the year counting toward a final overall championship, as ESPN recounts. This is generally considered the start of F1 as we know it today, and this is where the clock starts when we begin counting Grands Prix, as far as F1 is concerned. One of the original races for the overall F1 championship was the Indianapolis 500. This is where the contention about what qualifies as a Grand Prix begins. In modern times, F1 historians generally discount the Indy 500 as part of the Formula One championship. It was not an FIA-sanctioned event and was governed by an entirely different set of rules to the F1 championship. The points system was different. The racing was different. The cars were different. Many Grand Prix drivers didn’t make the trip overseas to compete in the Indy 500—the race was largely contested by U.S.-based drivers, so the results were generally not reflective of the overall season. If you compare the 1950 Indy 500 entry list to the 1950 Formula One entry list, for example, you’ll notice there isn’t a ton of overlap. The F1 drivers in their Alfa Romeos didn’t go overseas to compete against the Offenhauser-powered Americans. The only reason Johnnie Parsons ends up on the final F1 scoreboard at the end of the season is because he won the Indy 500. On the one hand, he has Formula One points to his name, and so he’s an F1 driver by default. On the other, he never raced an actual F1 car, so he’s not much of an F1 driver at all. Only two F1 drivers crossed the sea to attempt the 500 as part of the F1 championship: Alberto Ascari and Juan-Manuel Fangio. The great Ascari brought his Ferrari to Indy and crashed. The even greater Fangio accepted an offer from an American team to compete in the 500 and withdrew, unable to get up to speed. The Indy 500 was on the calendar from 1950 through 1960. That’s 11 races that you could argue aren’t really Formula One Grands Prix. Then, we encounter another problem. In 1952 and 1953, the driver’s championship was not run according to Formula One regulations. It was run according to Formula Two regs. Before the 1952 season, Alfa Romeo and BRM withdrew from the championship, citing that they felt they’d be unable to compete against the dominant Ferrari factory team. That basically left Ferrari as the only one with an F1 car that could win a race. So, fearing a total lack of competition, the FIA decided to make things easier for two years by running the more low-cost, low-power Formula Two spec cars. If F1, the top tier of racing, ceases to exist in favor of F2—does F2 essentially then become F1? It’s an interesting conundrum, but I’d argue that no, technically speaking, those races can’t really be counted as Formula One races. The F1 spec still existed, but no one felt they could compete with Ferrari. F1 was on hiatus and F2 was on the scene. That’s fifteen more Grands Prix you could scratch off the list, for a total of 26 races to un-count as a GP. So a little creative accounting would mean that weekend’s Chinese Grand Prix, technically speaking, would only be Formula One’s 974th Grand Prix. It will be the 974th time that F1 drivers compete under the currently-sanctioned Grand Prix rules. Of course, all of this is wildly pedantic and to some degree ahistorical, or anti-historical. It’s not particularly helpful to judge past races by today’s standards. 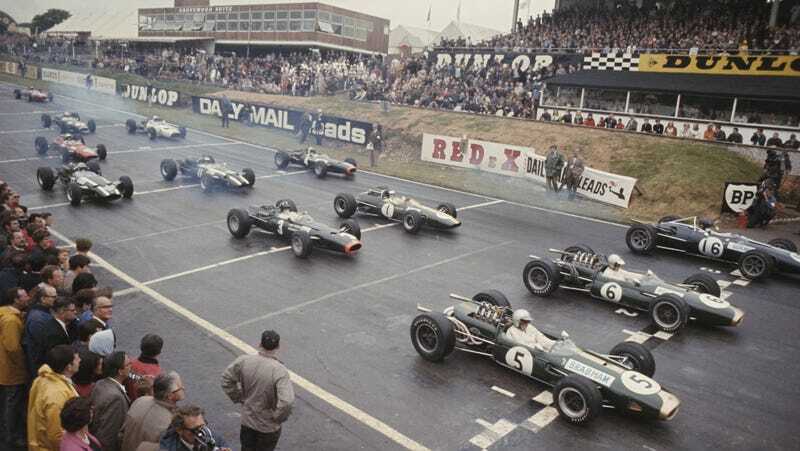 But even going back on past rules, it seems silly to only talk about championship races when counting grands prix and leave out all of the many, many, many non-championship grands prix that only dwindled in popularity a few decades ago. So will this weekend be the 1000th time F1 drivers will have competed for points? Sure! But know that F1's grip on history isn’t always as strong as it seems. There’s nothing here not up for debate.